I too would like an update on this. I believe one possible cause for this could be that the App and Box must be on the same logical LAN/vLan. I note that an earlier poster with this problem has a TPLink Archer router as have I. By default to support IP TV their routers create a separate vLan with its own address space and this is why I believe I can't get the pairing to work for any of my mobile devices be they on the BT or native YV apps. My suspicion is that the app scans the local address space that it is connected to for the box - 253 possible addresses for hosts and because the YV box is on a separate vLan it can't be found. It would be useful if they could add a specify IP address option to the app. A good insight, but how would specifying an IP address work? Or, conversely, how could the app be sure the IP address given wasn’t halfway across the world? Assuming the router is properly configured then the request from the mobile device to the YouView box on the second vlan would be forwarded via the default gateway on each network. Since the router intrinsically knows about both networks and address spaces it will not push the pairing request to the outside world. This of course would require the user to be able to identify the IP address of the YV box. I’m getting a little out of my depth here, but we are saying there aren’t overlapping addresses, such that there could be a (say) 192.0.0.7 on each vlan? And also that whatever packets the app sends out in its hunt for the YouView box aren’t forwarded to the other vlan by the gateway? An IP address can only exist once on each local area network regardless of whether that network is sub-divided into smaller LANs or vLANs. My guess is that whoever coded the app made an assumption that most domestic installations involve a single logical network with the usual maximum number of available addresses being 253. For the most part this is probably a valid assumption but there are good reasons for doing it differently especially where you need to manage different types of network traffic such as IP Multicast as used for IPTV. As for the 'YV Box pair/Discover' it is a simple thing to code a loop which tries each of these available addresses with a challenge/response structure - test each address and whichever one gives the right result wins the prize so to speak. The bottom line is that this mechanism simple and works in the majority of cases so is seen as a legitimate solution. Coding anything more comprehensive takes time and money. 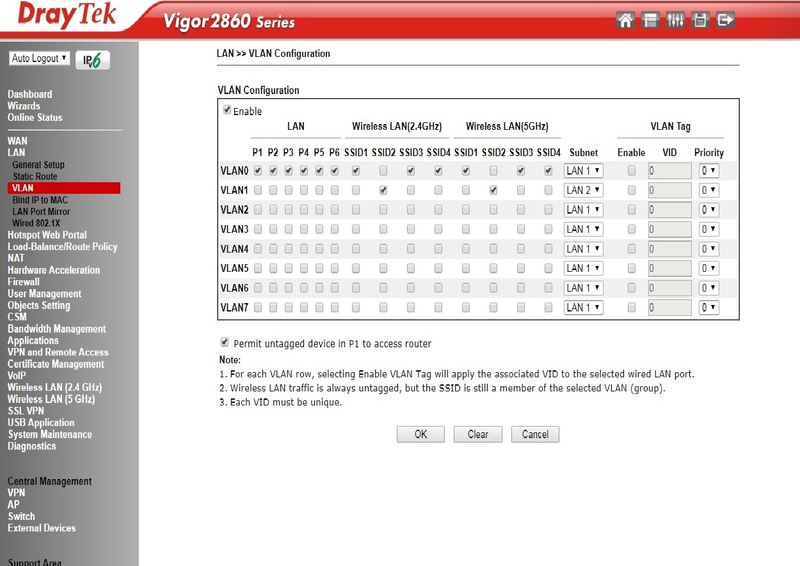 When a VLAN is set up it is assigned to one of the LAN's LAN2-7. Most routers allow you to configure how the traffic is routed between LAN's (or not if you want complete isolation). So an example from my router shows that VLAN1 assigned to LAN2 is used by SSID2 (my guest network) on both 2.4Ghz and 5Ghz wireless networks and is isolated from LAN1 so that any users of the guest network do not have access to anything on my local area network. I looked up VLAN For Dummies on the web, and rapidly found I needed a VLAN For Dummies, For Dummies. But your example I can understand. I think. And it tells me that even if I knew the IP address of your YouView box, if it were on your local area network, I couldn’t pair with it from the YouView app on a phone on the guest WiFi. True? Because presumably, the system would deny that there was such an IP address to be found. Also true? Of course VLAN's can be much more complex than in the example above, and are usually used to group together users, workgroups or departments in an office so that you can prioritise traffic within your LAN for instance. I am pleased my example was understandable. I've had a quick trawl through the TP Link Archer user guide, and the configuration screen you need is Advanced >Network > Interface Grouping. From there you should be able to add your default network to the IPTV VLAN, and then make sure that Enable Group Isolation is unchecked. I think this should be sufficient to allow you to pair your device. If your IPTV service degrades after this configuration, you can always check the group isolation box again to contain the multicast packets within their own network, since your device no longer needs to talk directly to the box. I Just need @Stephen to confirm that once paired, the YouView servers should be able to find the box? Stephen? That will be fine. Box (and app) connections are only outgoing, i.e. no connection is made from the YouView cloud servers back in to your home network. And the app doesn't need to re-find your box on the home network at any point once they're paired. We may need to with future features, but the only one I can think of is a way off in the distance, so you're safe for now. It looks like the TP Link configuration is to blame in @WilfH 's case. Although I don't have one of these routers, it appears that the router is isolating the port that the YouView box is connected to, and only sending Multicast Packets to that port. Why it's isolating the port into its own VLAN I can only speculate. All other routers I've seen use the more traditional method of broadcasting Multicast packets to all LAN ports, or if IGMP Snooping is set, to the ports that are members of that channel. Hopefully Wilf can apply the above configuration and report back success or failure. on checking the default group IGMP snooping was already enabled so I’ve actually solved my own problem by plugging the YV box to a port in the default group. In reality TPLink don’t need to recommend this way of adding support for IPTV. I suppose their intention was to isolate the multicast traffic from all the other ports but then why enable it by default in the default group. I think this is probably a big in their interface more than anything else. In paractice I have a single physical connection to the router to a Netgear hub which supports the YV box, aa NowTV box a NAS drive and PI with KODI. All my other devices are wireless which won’t see the multicast traffic in any case so this shouldn’t be a problem. Glad to hear that you got it sorted. It does sound like it may be a configuration "bug" in the TP Link. There is generally, no good reason to isolate the Multicast traffic on a domestic home router, since the impact will be negligible. Indeed if you have more than one YouView box you'll be plugging in to more than one of the routers ports (most people won't have a switch/hub connected), which on this router may produce one working box and one not working! Ugly, and difficult to fault find! I had also been having trouble connecting with a new Android phone. However after much trial and error changes on my Router, I discovered that by disabling IGMP Snooping on my Router the problem went away. I am no networking expert but I believe this has something to do with enabling Multicasting without restricting which ports are accessible. So I have IGMP Proxy enabled with default settings, but IGMP Snooping disabled. I hope this might help others. IGMP Snooping is required for multicast TV channels to actually work. So any BT/talktalk/Plusnet customers please don't turn this off unless you want error messages on your pay TV channels. IGMP snooping is not necessary for multicast to work. Its purpose is to reduce the load on a switch by filtering out multicast traffic on ports that are not using it, and to present only the groups that have been joined on ports with IGMP clients. On a home router, turning off IGMP Snooping is unlikely to have much of an effect on overhead, although it may impact some non IGMP client devices. I actually tested this before I posted at a friend's house who subscribes to talktalk TV and the net result was exactly as I posted the talktalk IP channels stopped working and brought a error message up. As soon as I turned it back on the channels started working. I thought this was the case but couldn't remember 100% so I double checked. Are you perhaps confusing IGMP Proxy and IGMP Snooping? No. Obviously if people are having issues with app paring it's nothing to turn it off pair the app and turn it back on. I am definitely not confusing anything however. I'm not trying to call you out on this one. There may be some reason the TalkTalk router you tested stopped passing multicast traffic when you disabled IGMP Snooping. It may be configured to do that, but I don't have one so can't check what happens. However, well behaved routers and switches will work as I described above, and in the Further Reading link. Thanks for the link @redchiz . Although that article says "enable IGMP Snooping" (and, for the record, I would always recommend doing so), it is not mandatory to do so in order to get your IPTV. So I just ran into this issue too. Standard BT Home Hub (latest version) with a few wi-fi repeaters scattered through the house. Standard BT YouView box connected through Home Plug - which means it shares a plug into the BT router with other traffic. Phone is an HTC U11+ running android 8.0.0 software number 1.24.400.3 and connected via wifi to BT router. ZeroConf browser finds the YouView box under _YV-BRIDGE. But the YouView app doesn't find the box As the facility to set recordings from anywhere in the world with a data connection and it doesn't do that anymore surely someone is liable to be prosecuted? I wonder if those wifi repeaters may be causing a problem, have you tried pairing the app with the box connected to the router directly by ethernet cable? Might be worth a go before considering who and with what someone is liable to be prosecuted. As the facility to set recordings from anywhere in the world with a data connection and it doesn't do that anymore surely someone is liable to be prosecuted? Hey, I've just ran into this problem too, had to reinstall the app and now won't find my YouView box. Humax DTR-T1000, Google Pixel EE router. Tried clearing cache, reinstalling and factory reset on box, nothing works! Same here after running a MM2 reset on my DTR-T1000 with BT Home Hub 5. Clearing App cache makes no difference.